One test strip for all radiator fluids! Quickly confirm the Anti-Corrosion protection level, in glycol, Dexcool, OAT, HOAT and even new GO5... not just the boiling point or pH. Ready to order, call 1(800) 266-4497 and speak to a representative. 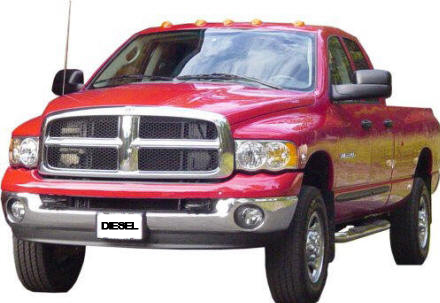 Have a Commercial or Diesel Vehicle? 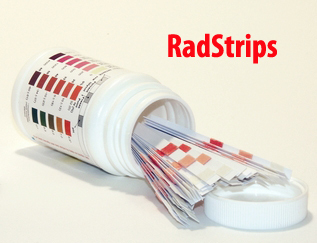 The RadStrip Line includes a Professional Product for you too! This single strip will test for Nitrite (0-3200 ppm), Molybdate (0-1000 ppm), Glycol (0-60%) and pH (6-13). Now you'll know for sure! #25-1570 quickly delivers a measurement of condition, based on freeze point, reserve alkalinity and pH levels. Note that there are 70 test strips in our Rad-Strip bottle, while most all other brands have only 50 and they general only test conventional fluids. Fast and accurate results are obtained with this newly developed test strip. They recommend service action based on actual engine condition, compared to supplemental inhibitor manufacturers' specifications. Regular testing of antifreeze coolant minimizes downtime and its associated cost, but creates a steady stream of new profits from maintenance service operations. An antifreeze coolant’s inhibitors depletion rate is affected by variations in formulas, maintenance schedules, blow by gases, topping off and other atypical conditions experienced during operation of heavy duty diesel and gasoline engines... test strips are the "only" way to determine the exact numbers. This single strip can be used to test conventional, DEXCOOL®, OAT, HOAT and GO5 antifreeze. Note: Test antifreeze coolant before any maintenance is performed to get an accurate picture. Be safe and do not open a hot radiator, let vehicle cool down before touching or removing the cap. Start with clean, dry hands and utensils. Run test in a well lit area, natural light if possible. Antifreeze coolant sample should be between 40° and 110° F.
Follow the test procedure enclosed with the strips. Dip the reactive end of the test strip (pad) into the antifreeze coolant. Test again if drain 1/2 or drain all maintenance is performed. If the result falls between colors, select the block in between. Read the color of the test strip after one but not more than after 3 minutes. (Note: The pad's color will change as the pad dries). Below 50° F read the color after 2 but before 5 minutes. Use the test strips by the expiration date on the bottle. Discoloration is caused by exposure for long periods above 100°F, direct sunlight, or leaving the bottle caps open for an extended period of time. Replace cap on the test strip bottle to protect from moisture. On occasion the dye in your antifreeze coolant may interfere with an exact match on the color chart. If this occurs, select the best match by color shade or depth. With practice, you will gain confidence and proficiency with the test strips. Dip one test strip into coolant sample below 110° F for one second. Remove the strip and shake once, briskly, to remove excess coolant. Match the end pad (freeze point) and then the pad nearest the handle (pH) to the closest colors within one minute. After one minute the pad's color may change as the pad dries. Dip one test strip into coolant sample below 110° F for one second. Remove the strip and shake once, briskly, to remove excess coolant. Match the end pad (freeze point) and then the middle pad (RA) to the closest colors within one minute. After one minute the pad's color may change as the pad dries. Ignore the Pad Closest to the Handle. To test Hybrid Antifreeze coolant use the results on the pH scale and the Freezepoint protection from the conventional scale. The Commercial side of the RadStrip Line! Test for Nitrite (0-3200 ppm), Molybdate (0-1000 ppm), Glycol (0-60%) and pH (6-13). Now know for sure! Radiators are under pressure. Hot coolant under pressure can cause severe burns. Do not remove the radiator cap on a hot engine. Wait until the temperature is below 50° Celsius (120° Fahrenheit) before removing the cap. Failure to wait may result in personal injury from hot coolant spray or steam. Remove cap slowly to relieve all pressure. Dispose of your used test strip with normal paper waste. Dispose of your used antifreeze coolant in accordance with local regulations. What are some of the common causes and effects of poor coolant? There are a wide variety of causes, effects and solutions of problems that might occur with your antifreeze coolant system. Indeed, there are more than we can list here. Please review the Coolant Cause-Effect Chart (Coming soon). Why do I need to measure the freeze point of the antifreeze in my car? A 50/50 blend of Antifreeze and water will provide freeze protection to -34 degrees and boil over protection to 257 degrees Fahrenheit. In colder areas of the US protection against block freezing is well known. With the higher efficiency and operating temperatures of vehicles, providing adequate boil over protection to prevent the loss of coolant and potential overheating and engine seizure is a must. Please review the Coolant Chart for Maintaining 50% Antifreeze (Coming soon). What results would I expect if I used the test strip in an Ethylene Propylene Glycol mixture? The results will be less than 1 color block conservative. Ethylene Glycol provides slightly higher freeze protection at like concentrations, and therefore contributes to a lower freeze point protection. Differences of less than 1 color block will result. What results would I expect if I used the test strip in an Ethylene Glycol mixture? The results will be less than 1 color block conservative. Ethylene Glycol provides slightly higher freeze protection at like concentrations, and therefore contributes to a lower freeze point protection. Differences of 1 color block will result. Does Antifreeze do anything other than provide protection from freezing and boil over? Antifreeze coolant has several uses. Foremost is its ability to help remove heat from an engine. Antifreeze and water have been used extensively since the 1950's as a heat transfer fluid due to its low cost plentiful supply, and easy and safe handling. What ways are there to measure freeze point? Can I use Antifreeze by itself? Antifreeze by itself has an insufficient boil over and freeze protection ability. It's the mixing with water that provides the freeze and boil over protection. Note that you must not exceed a mixture of more than 70% antifreeze to 30% water. Can I use water by itself? Water by itself is very corrosive and will not provide the freeze and boil over protection a combustion engine requires. Again, it is the combining of water and anti-freeze that creates the protection. Water by itself is corrosive to metals. The most familiar corrosion is rust, it develops as metals come in contact with air and water. Corrosion occurs with the other metals in a cooling system, copper, iron, aluminum etc. A good antifreeze coolant has an inhibitor package to protect against corrosion. How do I know if my antifreeze is protecting the engine against corrosion? The easiest way to test antifreeze for corrosion protection is with test strips. Our strip system tests more than just freeze point, you can determine if the antifreeze coolant is corrosive and/or has life left to protect the engine. How does a test strip work? Immersion momentarily into a water and antifreeze solution, of a chemically treated pad on the end of an inert plastic strip, begins the activation process. The strip caries a pH indicator, a reserve alkalinity indicator, a buffering agent and a color reagent pad especially correlated to various concentrations and freeze points of antifreeze solutions. How accurate are the test strips? In a blind field test of over 200 people using antifreeze and water dilutions of 25, 33, 40, 45, 50 and 60%, approximately 90% of the readings by the test strip as interpreted by the people in varying levels of light were within 10 degrees of the refractometer readings. Does the test strip work in hot Antifreeze? In comparative tests in hot Antifreeze (70º to 90º C) it was determined that the color development is faster, and therefore the reading will be one color block darker than the reading of the cooler Antifreeze. What temperature should the Anti-freeze be in order to get the best readings? The Antifreeze should be less than 120º Fahrenheit. Colder antifreeze does not have an affect on the rate or final color development. Antifreeze of 120ºF is cool enough to be handled, and the radiator cap is readily and safely removable from the radiator at that temperature. Can I test the Anti-freeze in the overflow bottle? It depends on the level in the overflow tank. Generally if there is sufficient liquid in the overflow bottle it is representative of the antifreeze coolant mixture in the vehicle. However if you just added additional 100% antifreeze to the overflow container, or if the level is very low, it would not be indicative of the mixture in the cooling system. Is the technology covered by a patent? Yes! The method is based on technology used in medical analysis of urine. It was originally developed years ago, to assist people with diabetes to determine what treatment they needed. That technology was later improved regarding the test strip's sensitivity, accuracy, and readability in Ethylene Glycol, Propylene Glycol, and OAT type coolants, to assist maintenance professionals and consumers determine what treatment Heavy or Light Duty coolant systems need. What is the shelf life of the test strips? Test strips in the bottle packages are guaranteed to work 2 years from date of manufacture. How can I tell if the test strip is still good? The pad will be a brown color versus the white to light yellow that a fresh pad will have. What do I do with the used test strip? Test strips are to be disposed with normal paper waste. They are not hazardous or toxic. Do test strips really work? Yes. Test strips were developed for medical diagnostic and laboratory use over 30 years ago. Since that time they have replaced liquid tests and supplemented instrument tests. Ethylene glycol was first prepared in 1859 by Charles Adolphe Wurtz, a French chemist. Why was glycol first researched? They originally thought it might be an additive for nitroglycerin explosives, to prevent freezing. When was ethylene glycol first produced in the US? McElroy obtained a series of patents on ethylene glycol manufacture beginning in 1915. The Commercial Research Company developed the process to produce ethylene glycol to a semi commercial scale in 1917 and continued operation in Flushing, LI until 1920. While the use in antifreeze was foreseen at that time, the chief use was in the manufacturing of explosives. Dr Curme Jr. at the Mellon Institute in Pittsburgh, Pa developed in 1920 a commercial method to synthesize ethylene oxide, ethylene glycol and others for the Pres-O-Lite Company. The first commercial plant in the US was in South Charleston, Va. in 1925. US Patent 1,213,308 was issued to Hibbert for the use of ethylene glycol for lowering the freeze point of water in automobile cooling systems. Following the first manufacture of glycol in a large commercial scale in 1925, uninhibited glycol distributed. Three years later research revealed that untreated ethylene glycol could become corrosive to the cooling system metals changes were made. From this time on, the major participants in the antifreeze coolant market place adapted the corrosion package to meet the changing engine and cooling requirements. How important is the quality of water used with antifreeze coolant? Note: If you're in doubt, we have a special water quality test strip kit available for the shop.